We’ve been snowed in here since Sunday night. 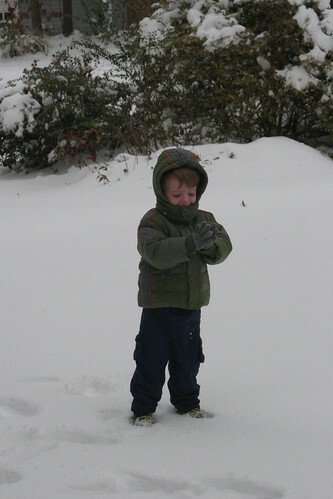 Our house got between 5 and 8 inches of snow, which delighted my son and husband who had a great time playing outside. I prefered to stay indoors where it was warm and drink hot chocolate. Now that the main roads are passable and the route from our house to a main road is still treacherous but do-able I can say that it’s very pretty to look at and I’ve enjoyed it. I’m just glad our second son didn’t decide to make his appearance during the height of the storm (I’m due to go into labor any day now). I feel for my Northeastern friends who are getting the storm now. I hope they’re able to enjoy it and don’t lose power! Snow and hot chocolate, the perfect combination! I’m really glad to hear the roads are now more or less clean and open, so you don’t have to give birth at home!